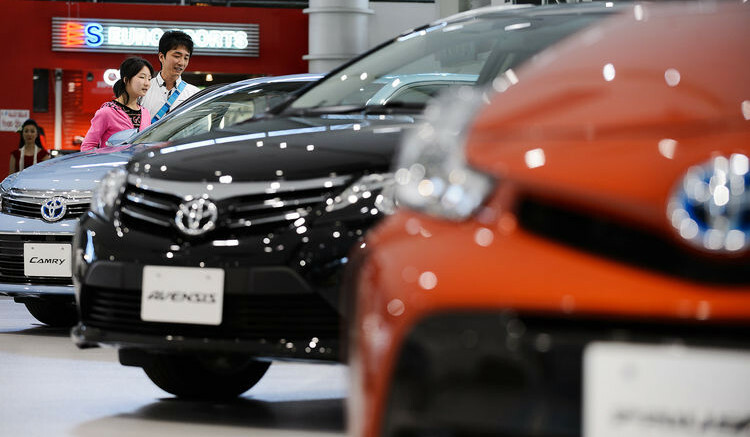 About two months after creating so much excitement in Lagos with the launch of the eighth generation Camry, Toyota Nigeria Limited last week took the new vehicle to the just concluded Abuja motor show and it expectedly was the cynosure of all eyes. The Camry Forum was a special event where some select very important personalities were invited to interact with the Managing Director of the TNL, Kunle Ade-Ojo, on the elegant features of the new car. Apart from the Camry, there were other Toyota models on display at the motor show. The Public Relations Manager of the TNL, Bukunola Ogunnusi, explained that this year’s exhibition provided another opportunity for the company to bring all the Toyota models under one roof for visitors and prospective buyers to have a feel of the auto firm’s superior quality products. The Camry as a Toyota model has since its first launch to the global market in 1982 remained one of the bestselling family cars on account of its functionality and reliability. The latest generation of Camry, according to auto analysts, has been made sportier, combining functionality with style, power and comfort. Ade-Ojo, at the press launch of the vehicle in Lagos had described it as another masterpiece from the stable of Toyota Motor Corporation Japan to the Nigerian automobile market. According to him, the Camry as a model has enjoyed a high level of goodwill and acceptance not only for the superior quality engineering behind it but also for its stunning beauty. The TNL’s Brand Manager, Mr Bayo Olawoyin, said the models being introduced to the Nigerian market, 2.5 litre and 3.5 litre petrol engines, would impress many with their cool features, which were a collection of luxury, high-tech and safety quality. He said the vehicle had been specially built to offer improved ride control, quietness and an “interior that projects an immediate feeling of excellence on the one hand and a driving experience that everyone appreciates” on the other. He listed some of the striking features as back monitor with pedestrian detector, intelligent clearance sonar rear cross traffic auto brake, adaptive front lighting system, rear electric sunshade, rear electric reclining seats, electronic parking brake. The new Camry’s selling points, according to Olawoyin, are found in its leading fuel economy and driving performance; high quality ride; top-class safety performance; and segment leading advanced human machine interface. He said the vehicle interior had been redesigned to be roomier especially for the rear occupants to enhance the luxury feel of the vehicle. The seats had also been redesigned to increase comfort for all occupants, he added. He said, “Camry’s newly developed direct shift eight-speed automatic transmission improves acceleration from a stop, provides a smooth ride even at high speeds and helps enhance fuel efficiency. Its rear seat can be reclined at the touch of a button, reduced gap between windshield and roof to reduce wind noise; a hood silencer to keep engine noise out of the cabin, rear control panel allows power seat, power sun shade and AC adjustment from the rear cabin of the vehicle. The new Camry is said to offer a compelling choice of petrol engines, the all-new 2.5L Dynamic Force four-cylinder and a new 3.5L V6, each delivering a sophisticated blend of performance and efficiency. Toyota said, “Both engines utilise the D-4S direct-injection system, which selects the optimal injection method based on driving conditions to pack a powerful punch with enhanced fuel economy to boot. Talking about performance, Olawoyin explained that the new Camry’s high efficiency, high-powered next generation Dynamic Force Engine, powerful acceleration and new direct shift 8AT had contributed to the car’s low fuel consumption. Be the first to comment on "Toyota Lights up Abuja Fair With All-new Camry"